A pulmonary embolism is a blood clot in the lung that occurs when a clot in another part of the body moves through the bloodstream and becomes lodged in the blood vessels of the lung. This sqadia lecture also gives an understanding of pulmonary circulation that is the portion of the circulatory system which carries deoxygenated blood away from the right ventricle of the heart, to the lungs, and returns oxygenated blood to the left atrium and ventricle of the heart. 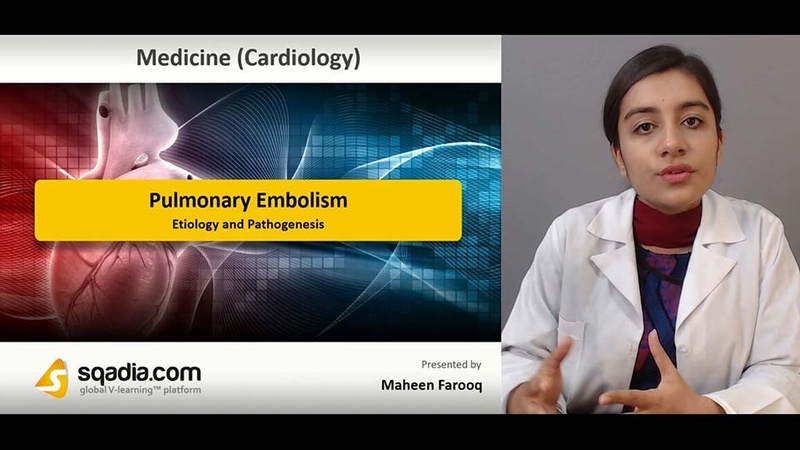 Etiology of pulmonary embolism is blood pooling, inactivity, fracture, and smoking. Pulmonary embolism can arise from anywhere in the body, most commonly it arises from the calf veins. The venous thrombi predominately originate in venous valve pockets and at other sites of presumed venous stasis. To reach the lungs, thrombo-emboli travel through the right side of the heart. 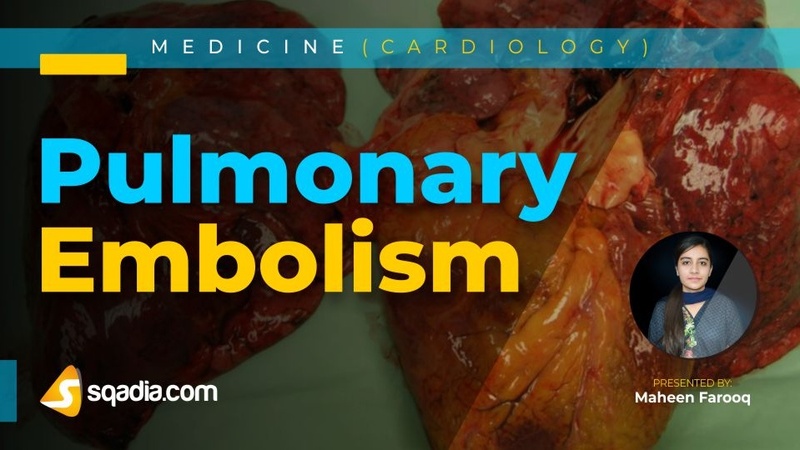 Risk factors associated with pulmonary embolism are obesity, inactivity, smoking, oral contraceptive, and family or personal history. Sudden cardiac death, pulseless electrical activity, and lung infarction paradoxical embolism are some of the complication of the disease. It can pe prevented by maintaining a healthy weight, by exercising, and quitting smoking. Common sign and symptoms are shortness of breath, chest pain, cough, and fever. Other signs include leg pain or swelling usually in calf, excessive sweating, light-headedness or dizziness. Diagnosis can be carried out by analysing levels of D dimer through blood tests, by ultrasound known as duplex ultrasonography, by pulmonary angiogram, and by electrocardiography. Here at sqadia.com, along with the pathogenesis, complications and diagnosis, we also focus to let our readers know how to manage the respective disease. So, pulmonary embolism can be managed non-pharmacologically, pharmacologically, and surgically. Non- pharmacological management includes compression stockings, leg elevation, pneumatic compression. Pharmacological management is associated with the use of anticoagulants, and thrombolytics. Surgical management involves thoracotomy and transvenous catheter embolectomy.